Murray, though, is a different story. He hasn’t reached a final in 14 months. He’ll fall out of the Top 10 if Cilic wins Monday. 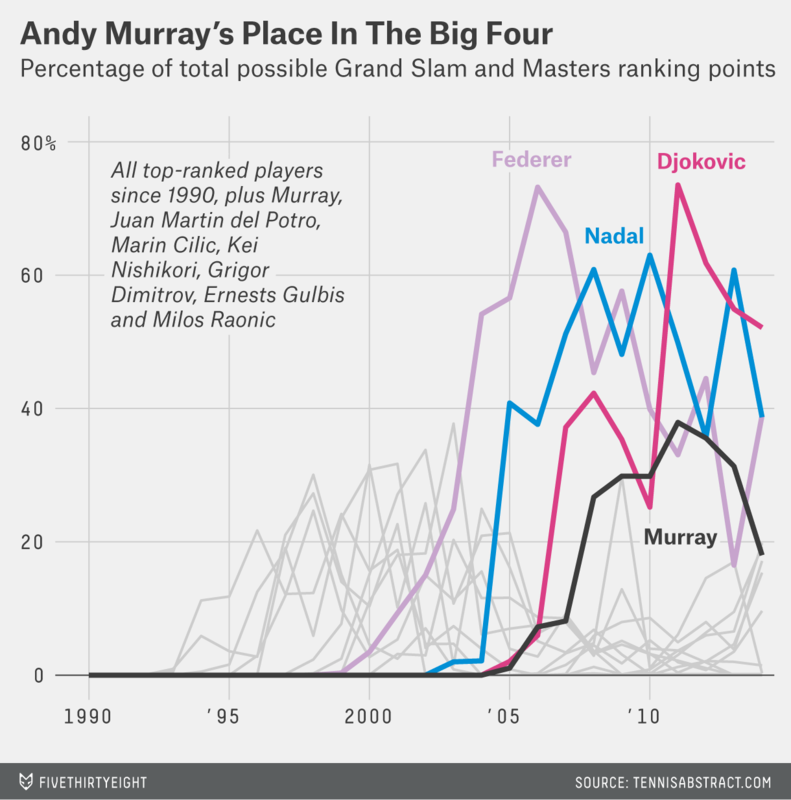 Murray has always been a bit of a different story — an awkward fit in the Big Four. It’s often seemed like a Big Three and Murray. The other three each have at least seven Grand Slam titles and have been ranked No. 1 for more than 100 weeks each. Murray has two Grand Slam titles and peaked at No. 2. Murray’s overall record at the biggest tournaments makes him mostly worthy of his Big Four status, but it also establishes how far behind the other members he is. Despite repeatedly and unfortunately having to face them, Murray trails only those three players in career success, among anyone whose Grand Slam career began in the past quarter-century. We compiled annual results for 19 players at the four Grand Slams and the nine Masters tournaments, the 13 events where nearly all the top players compete, pulling data from Tennis Abstract. Then we calculated the number of ranking points each player earned at those tournaments — using the current point distributions — and divided by the maximum number of points each could have earned. So, for example, to earn 100 percent of possible points, a player would have to sweep all 13 tournaments. We prorated this year’s numbers and split the 800 additional points Monday’s winner will earn between Cilic and Nishikori. Our 19 players are the Big Four, the second line of five players mentioned in the companion article — Cilic, Nishikori, Grigor Dimitrov, Ernests Gulbis and Milos Raonic — and their contemporary Juan Martin del Potro, and the nine non-Big Four male players who reached the No. 1 ranking and started playing Grand Slam tournaments in 1990 or later (1990 is when the Masters events began, under a different name): Lleyton Hewitt, Andy Roddick, Gustavo Kuerten, Marat Safin, Juan Carlos Ferrero, Yevgeny Kafelnikov, Carlos Moya, Marcelo Rios and Patrick Rafter. What’s striking about Murray is how much his curve is dwarfed by those of Federer, Nadal and Djokovic — and yet how much his curve towers over almost everyone else’s. His peak season, in 2011, is better than the best season of each of the non-Big Four players we studied. Even Murray’s fifth-best season, in 2010, is better than the best season of four former top-ranked players: Roddick, Moya, Rafter and Kafelnikov. Or, if “better” isn’t appropriate for a season that doesn’t include a Grand Slam title, then Murray’s season in which he had the fifth-highest weighted average level at big tournaments was more consistently good than the career best years for four players who reached the No. 1 ranking. We concluded our earlier piece by saying the second line and del Potro should aspire to match Murray. That’s no small achievement — and it could be big enough to reach the No. 1 ranking he’ll probably never attain, because these younger players are less likely to have to contend with the likes of Federer and Nadal for the entirety of their careers.